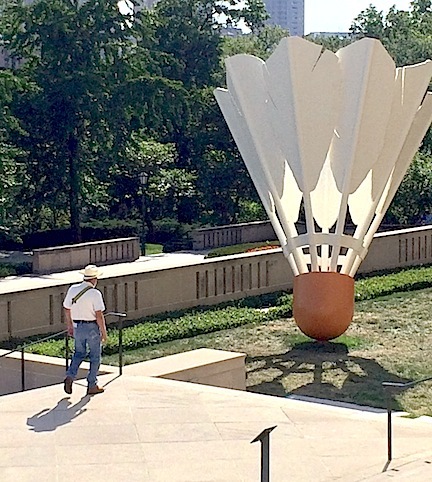 Yep, the Nelson-Atkins Museum of Art is the one with the shuttlecocks on the lawn. 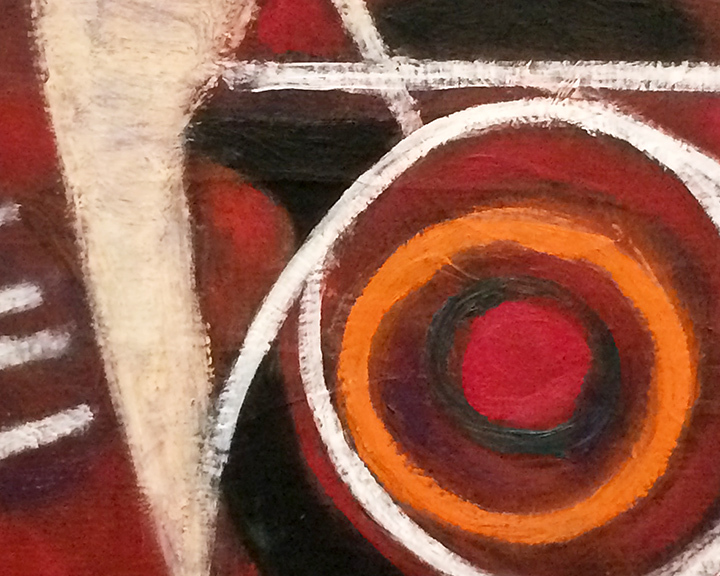 Detail of “Crow Call (Near the River),” Keith Jacobshagen, Nelson-Atkins Museum of Art. 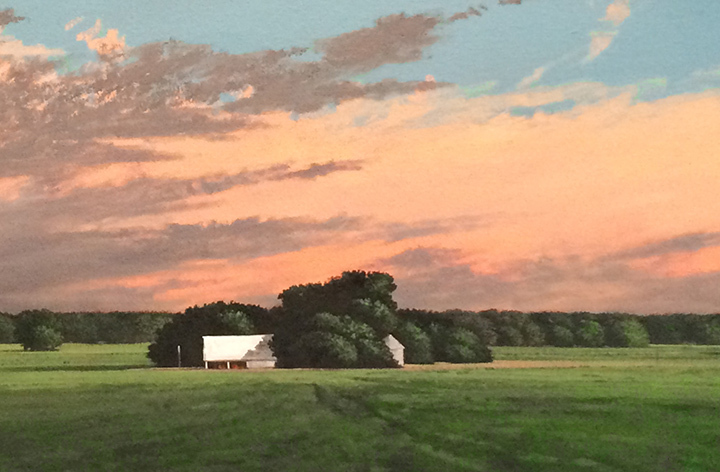 The artist is from Wichita, Kansas. 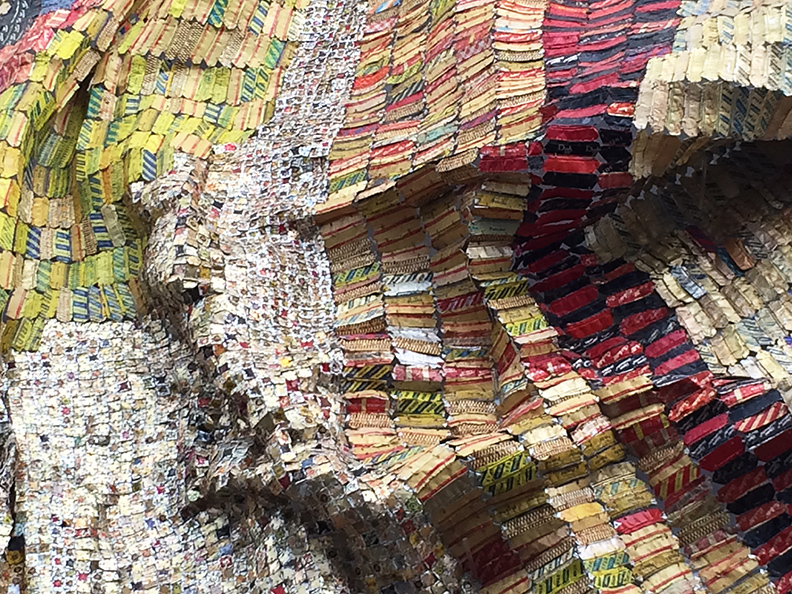 Detail of “Dusasa I,” by El Anatsui, Nelson-Atkins Museum of Art. This work, a showpiece of the addition, is a very large wall hanging, several feet on each side, made of flattened liquor-bottle caps stitched together with copper wire. The artist, who was born in Ghana, now works in Nigeria. 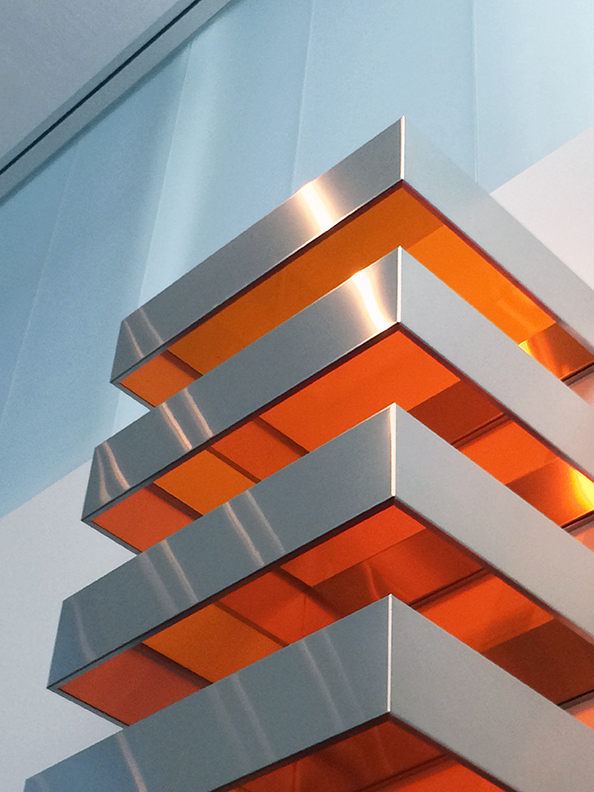 Top of “Large Stack,” Donald Judd, Nelson-Atkins Museum of Art. Days 14 & 15: Lawrence to Carbondale. After an initial delay on Sunday morning, I made it at last to the Nelson-Atkins Museum of Art in Kansas City for my second visit. 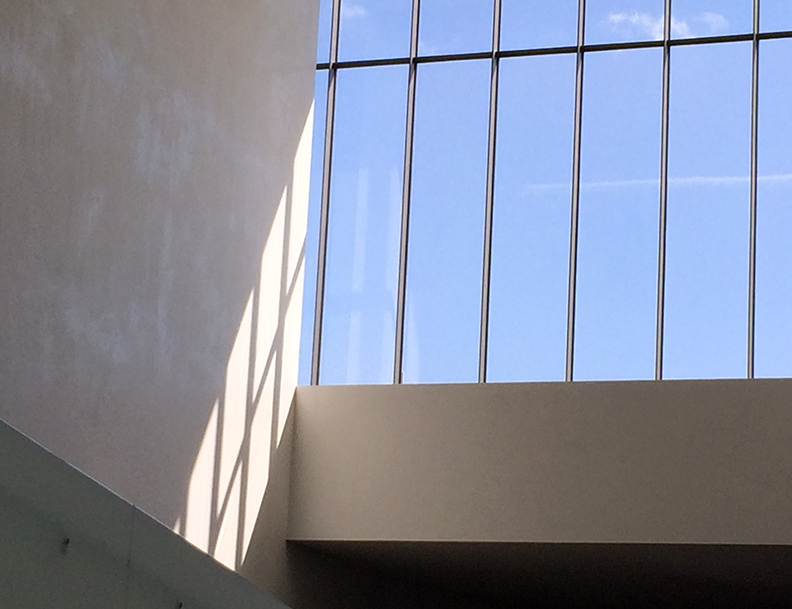 I spent most of my time in the Bloch Building, the 2007 addition to the museum by architect Stephen Holl. From the street to the east, the addition looks something like a series of connected trailers rising up a hill. But from the inside, it’s phenomenal, with light coming in from windowed towers and interesting angles everywhere. I hate to say this, but I found it far superior to my beloved St. Louis Art Museum’s more recent addition, both architecturally and in the modernist collections that both additions house. 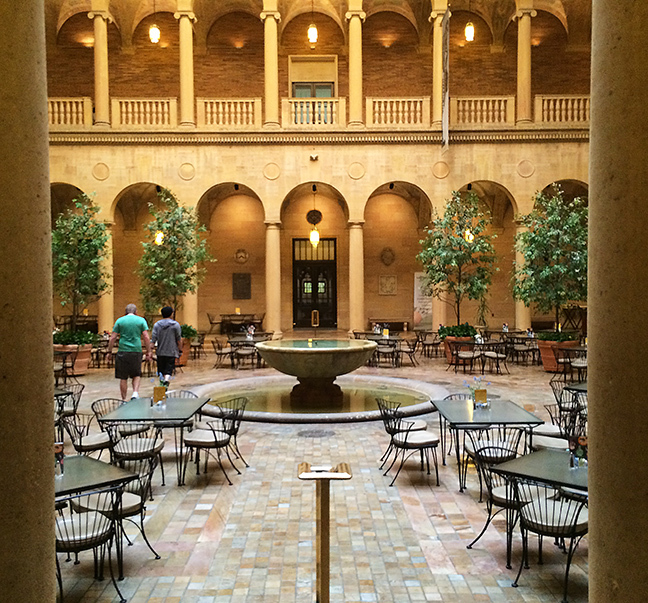 I spoke to a museum guard about the photos I was taking of the interior. He pointed out how each gallery opened up a new view via a few steps down into the next, leading the visitor through the building. 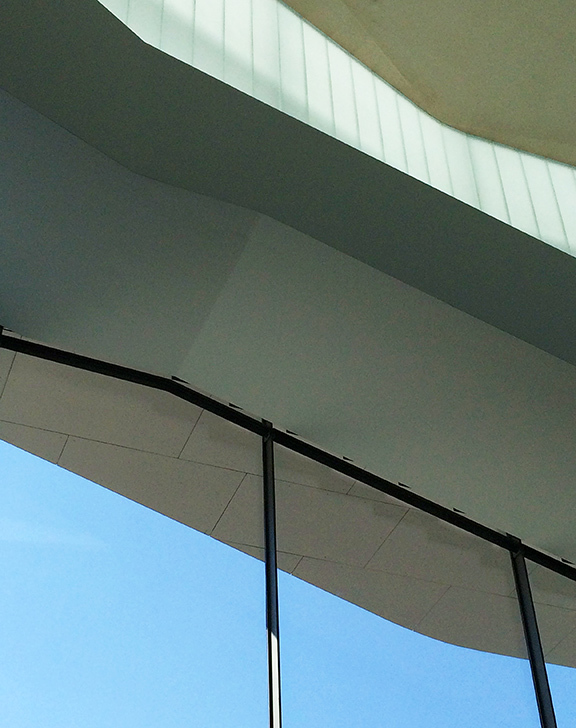 In fact, he said, a photographer had been there earlier that day on behalf of the architect, who visits periodically. I’ve included here small, low-res details of four or five of the works at the museum, hoping that constitutes “fair use” for copyright purposes. Most of my time was spent in the modernist collection. I never even made it to the photography galleries (irony! ), and though I visited the main sculpture court, which has several Rodins, I was disappointed to have missed the Isamu Noguchi sculpture court. A next visit is in order. I spent my last 45 minutes at the museum trying to track down a still-life of lemons that I recalled vividly from my first trip. (I collect art postcards, and am often vexed that museums so seldom have my particular favorites in their shops.) I asked one guard if he recalled a painting like that. “Let me ask someone else,” he said. “I haven’t been here too long.” I couldn’t tell if he was actually contacting someone on his phone, and I told him Don’t worry, I’ll keep looking. I said I thought it was a European painting, and he said American. I’d already made a mad dash through the European galleries, so I headed for the American art. No luck. I found another guard and asked her the same question. “Let me ask someone else,” she said. “I haven’t been working here that long.” She said she’d be back in a minute and I sank onto a bench to rest my feet and knees, still sore from the fall at Estes Park. Two minutes later she came around the corner with the first guard in tow. We both started laughing. But the first guard had, in the interim, gotten some information and gave me the exact number of a gallery that featured a painting with lemons. Well, I’d been in that gallery, and this painting hadn’t stopped me. Memory is a tricky, tricky thing. Either that, or this was in fact a different still-life. It was a fine painting, and I took photos of it, but in my mind a very different painting still exists, with luscious, incredibly realistic lemon slices and…a fish, I think. Hmmm…. At closing time, I headed out of Kansas City for Boonville, where I stayed overnight. The next day, Labor Day, I was home by mid-afternoon, unloading the car and looking forward to getting the doggies out of the kennel on Tuesday. I was very tired, but I’d done my trip. It wasn’t like hiking across Africa or climbing Everest. It wasn’t even Paris. To most people it will seem a very modest achievement. But to me, debilitated after years of depression and anemia, this road trip loomed pretty large as an accomplishment. I think I’m ready to do it again in a different direction.